"I’m very honoured to be Tilly’s ‘Miss September’ and tell you the tale of my average working day. Unlike the previous interviewees for Tilly’s ‘A Day in the Life’ feature, I am not an independent business woman, but I am ‘allowed' to think about sewing all day. 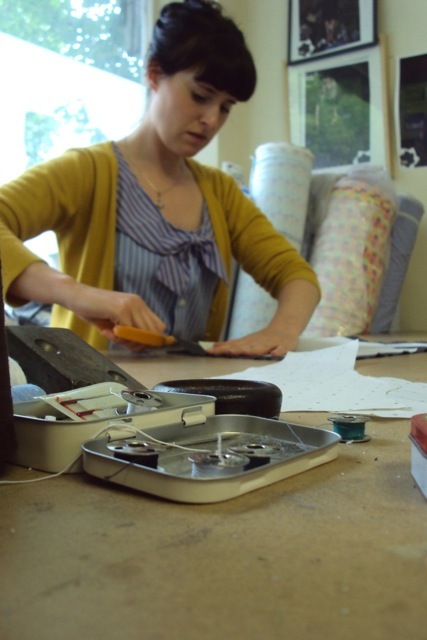 For nearly a year now, I have been the assistant at the small clothing label TRAIDremade, one arm of UK-based charity TRAID, which recycles textiles for international aid and development. 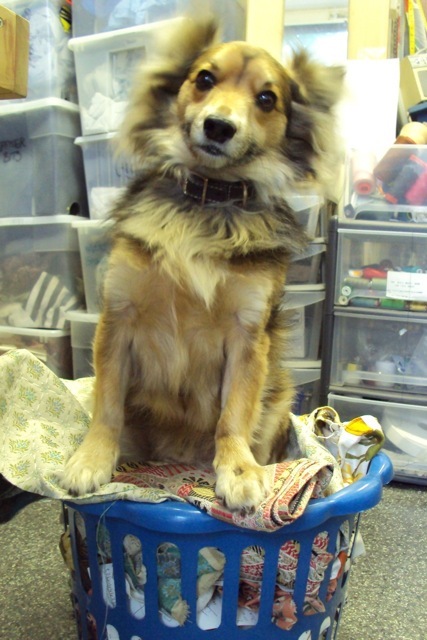 TRAID aim to reduce landfill by collecting unwanted clothing and textiles. The collected items are sorted and the reusable ones are sold in their network of London based charity shops, whilst the rest gets recycled into pulp or sent down to our TRAIDremade studio. Based in Brighton, my boss Paula and myself upcycle and transform unsellable garments and donated fabric into a range of womenswear, which is sold in stores in the Camden and Clapham TRAID stores and on the TRAIDremade website. My alarm goes off at 7.15am which always feels horrendously early, as I’m more of a late owl. Having accepted the injustice of my rude awakening, I shower and get dressed. I work all day with just one other person and a dog, far away from the prying eyes of the general public, so I can wear whatever I want, but I do try and make a vague effort. I usually try to put together a decent outfit, deal with my hair and slap on some makeup. My breakfast invariably consists of a small strong coffee made in one of those little silver Italian coffee pots and Branflakes with masses of raisins and milk. I walk to and from work which takes about half an hour, though I usually leave the flat a bit late so have to speed-walk to get there for 9am! Except for when it’s raining or snowy, I’m grateful for this enforced daily burst of exercise. The first thing I usually do when I get to work is put the kettle on and check the milk situation. Then I start work whilst having a natter with my boss about what we got up to the previous night (which is usually very little as both of us rarely go out on a ‘school night'). Most mornings, I will already be in the middle of finishing up the block of garments I started the previous day, so I will just get on with that rather than starting something new. I will have already figured out the manufacturing process for those garments so I can work on autopilot and listen to the radio until my brain wakes up an hour or so later. I’m very lucky that I get on so well with both my colleagues: my boss, Paula, and her dog, Piglet. Being stuck in one room day in day out with only one other person to talk to could be hell if we didn’t click and didn’t have similar tastes in music and radio comedy shows! Every other Friday a truck comes down from London to deliver the garments and fabric for us to work on and to collect the stock we have produced and the ‘rag’ to be taken back to the warehouse for recycling. We have quantity targets to meet: 50 garments between the two of us each week, so five garments a day each. Some days we may produce more, if we are working on a speedy jersey design, for example. Other days we may produce less, if we are making a complex dress or jacket perhaps. These targets includes any pattern cutting/tracing/adaptions, cutting out the pattern pieces, constructing the garments and any hand finishing they may require. Paula is a very innovative designer: she plans the range, the general direction she wants it to go in, and the specific pieces she wants us to include for the next delivery/collection. I am less design-led, but when I do squeeze out an idea, she is open and with maybe a little tweaking I am usually allowed to go ahead and make them. 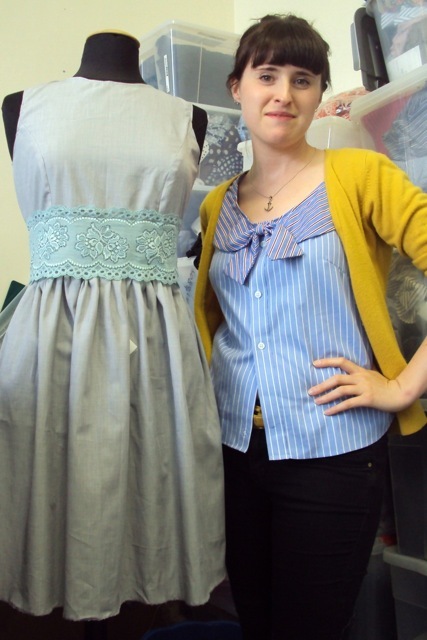 Paula is excellent at upcycling existing garments, and loves to work with jersey. She also works with leather and makes some phenomenal bags and accessories from old leather jackets using the recently donated leather sewing machine. I tend to be more adept at making garments from scratch from the woven fabric we receive. Because of the time constraints, we often use existing sewing patterns as our starting point then make our changes, like adding/removing/altering sleeves, collars, hem lines, straps, detailing etc. We also figure out how we can simplify the manufacture process by, for example, eliminating facings, inserting zips instead of buttons, and avoiding styles that require linings. Also, we never use pins when cutting a pattern out! The main thing I’ve learnt in this job is to speed the hell up. I’ve also learnt to see much more potential in unwanted clothing that I did before. 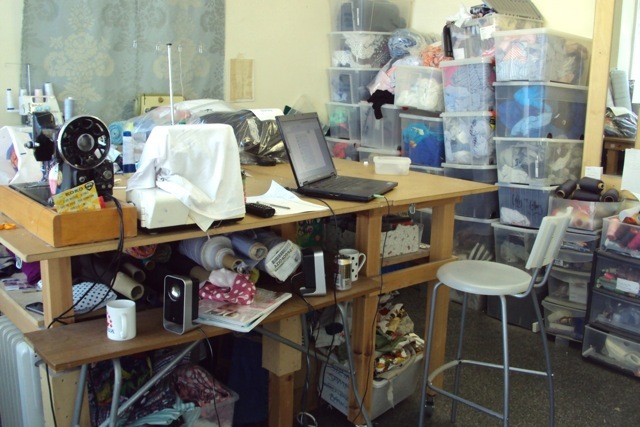 Our studio is pretty chilly and dirty, and to the untrained eye it may appear disorganised and chaotic, but I love it. Being amongst the rolls of fabric, stack of patterns and industrial machinery is where I belong. For years, I longed a studio of my own, but with the space and access to machinery I currently have, there is no need. 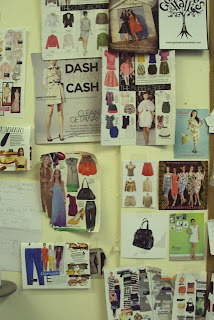 I even keep my personal fabric stash and hoard of sewing patterns here for easy access. Lunch is 12pm - 1pm. Paula takes Piglet out for a walk but I stay in the studio. I eat my sandwiches at the computer whilst checking my emails and dealing with any Brighton Craftaganza stuff (I co-organise a local craft market). The rest of my lunch break is spent on my own pattern cutting and sewing projects. I finish at 5pm and walk home, usually going to the supermarket on my way. I aim to go jogging three times a week, so if it’s one of those evenings I get changed and go out again immediately, because if I sit down for any length of time it’s just not going to happen. My boyfriend Pat and I share the cooking duties, roughly on a week on/week off basis. He’s relatively new to cooking and is getting really good, but I don’t enjoy it much. I derive far more pleasure from the eating part! I’ll usually spend a chunk of the weeknight evenings on my laptop: writing for my blog or the Craftaganza one, reading other people’s blogs, organising challenges like Self-Stitched-Sept '11, hanging out on eBay, and so on. I’ve usually got a game of ‘Governor of Poker’ at any one time. Sometimes I’ll leave the laptop alone and spend half an hour or so working on a sewing project. If I’ve attended to my laptop-business early enough, we’ll watch a film or episode of something. I try to read a bit before bed, but usually get too tired and it’s lights out by 11pm." Crikey, five garments a day! Puts my one-a-month effort to shame. Thank you, Miss September!